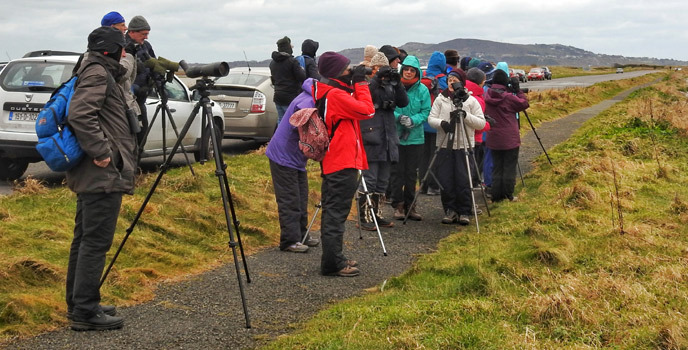 South Dublin members at North Bull Island with Hill of Howth in the background. Picture by Gustavo Zoladz. The creation story of North Bull Island, Clontarf, is a story essentially of the force of nature gently assisted by the hand of man. The formation of the Island has been ongoing for 1,000 years, dating back to a time when the silting sand was causing problems for shipping, except for the flat-bottomed long-ships of the Vikings. Now an ornithologist’s utopian paradise, it is thought that some 40,000 birds, of many species, winter on the island. Many of these birds migrate here from the Arctic in early November and remain until April during which time they fatten on the unique grasses, plant and animal life along the mudflats and saltmarshes. 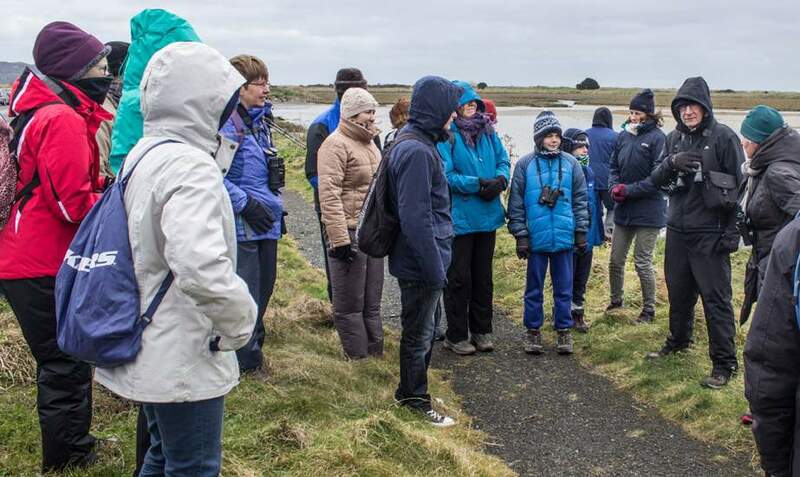 The island has a very inimitable flora and fauna and a visit to the Visitor and Interpretative Centre is obligatory for anybody who wishes to understand the magic of this world-acclaimed Clontarf attraction. 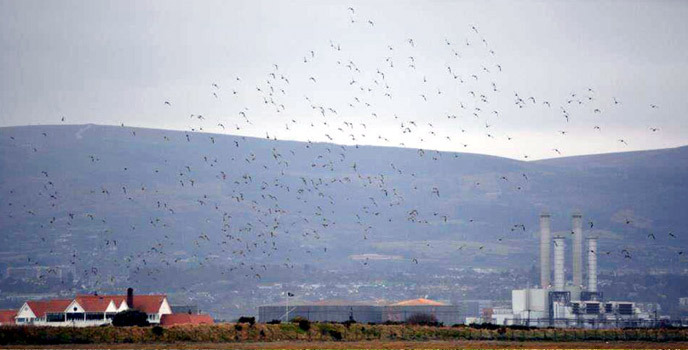 Waders over North Bull Island with Royal Dublin Golf Club and Port of Dublin in the background. Picture by Brian Turner. 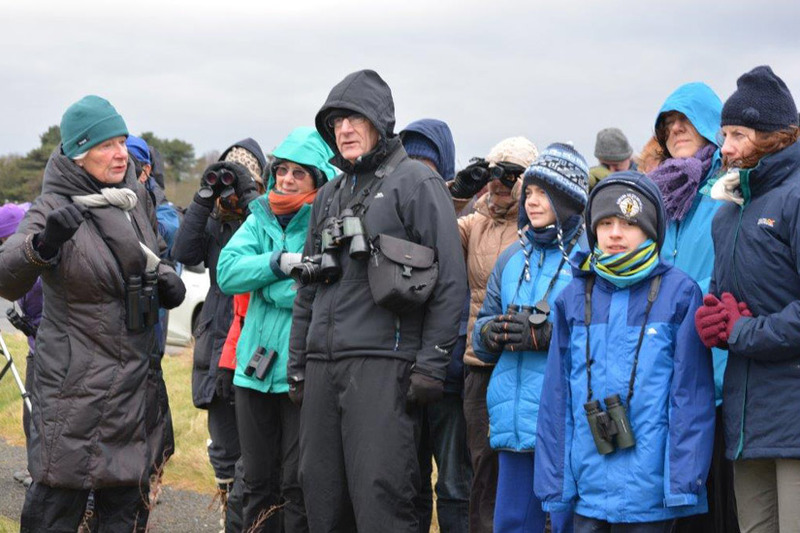 A group of 25 intrepid birdwatchers, gathered on the North BulI Island Causeway, on a truly difficult day for birdwatching. 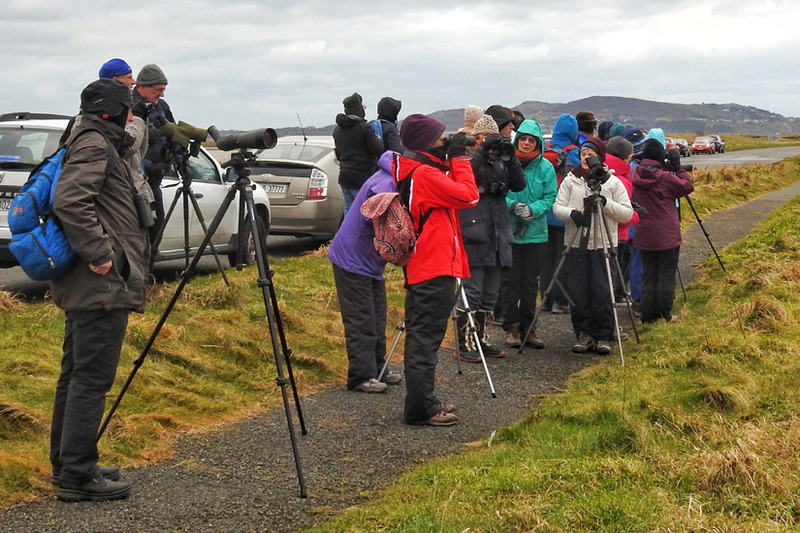 A gale force easterly wind combined with a temperature of just 4°C, made for icy conditions and a communication challenge, not to mention ensuring that telescopes did not tip over in the strong wind. 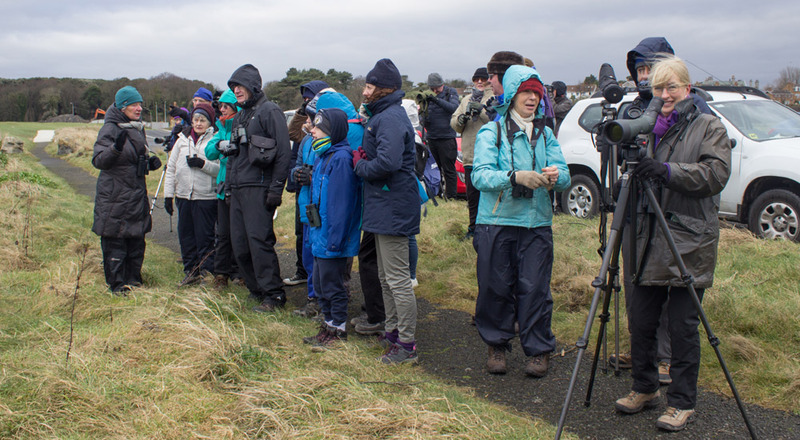 However, we took on the challenge and with the help of some scopes provided by members of the branch got some good sightings of birds that were close by as poor visibility made it difficult to pick out more distant ones. A large flock of Grey Plover mixed with some Golden Plover provided an uplifting start. Having them close together was useful to note the contrast in plumage. Another member of the plover family, richly coloured Lapwing also gave good views and several flight displays. 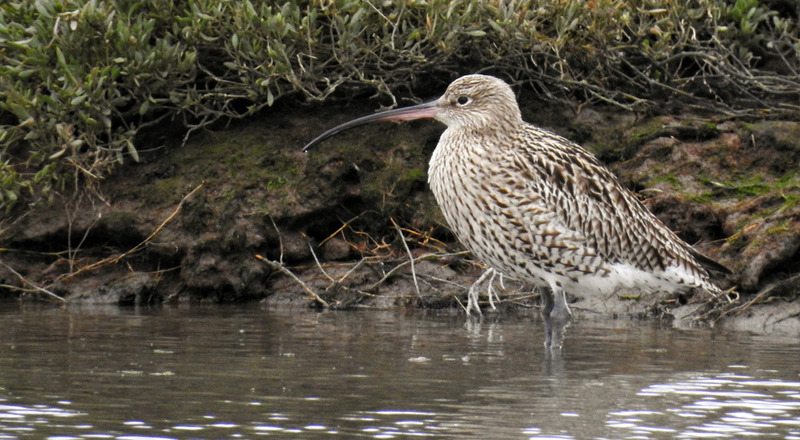 Curlew in quiet reflection on North Bull Island. Picture by Gustavo Zoladz. Large numbers of Redshank were already roosting. 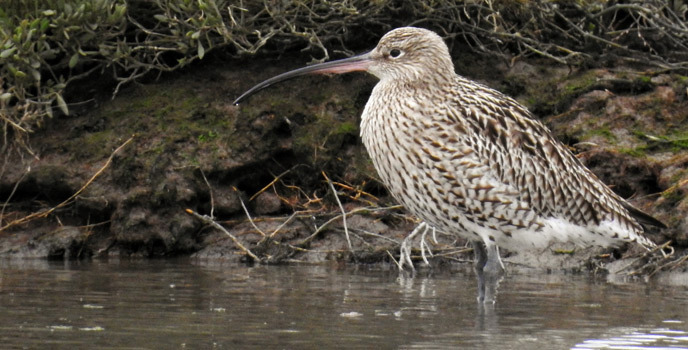 A few Curlew, some Black-tailed Godwit and Dunlin were feeding as the as the rising tide pushed the birds ever closer. Many flocks gave us fantastic swirling flight displays as they took off to roost. 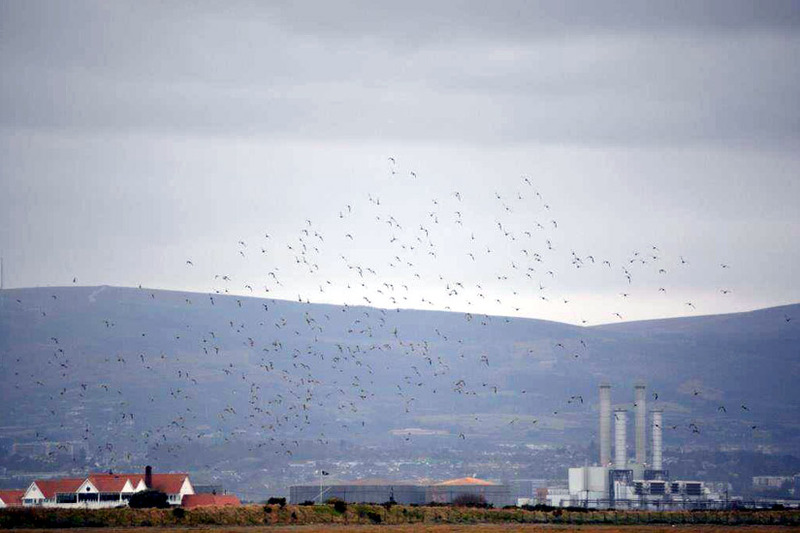 Several groups of Brent Geese also flew over the causeway perhaps heading for ease from the unrelenting east wind. 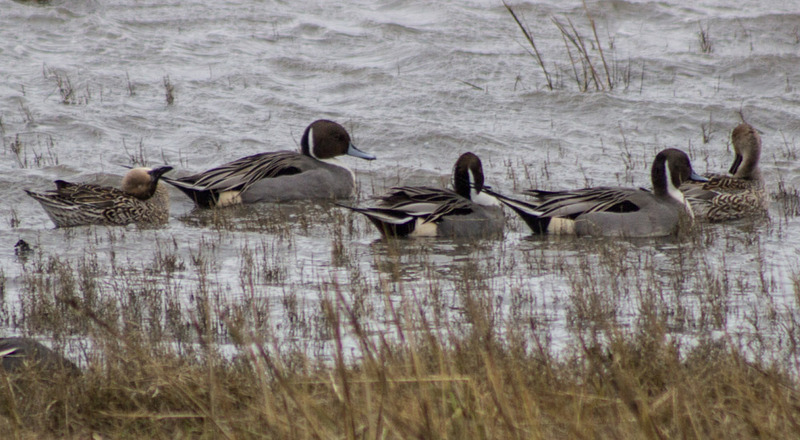 North Bull Island is winter quarters to huge numbers of duck, including Wigeon, Teal, Shoveler, and Pintail. 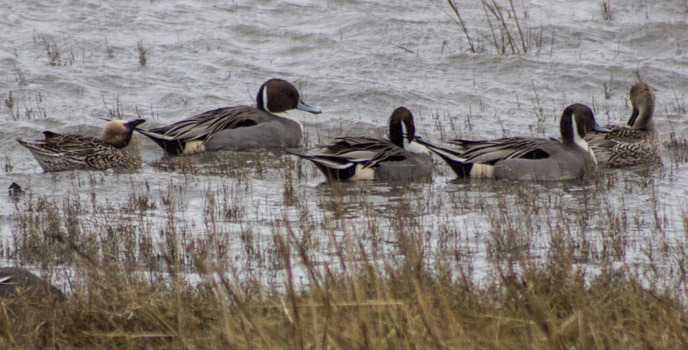 Many of the group came especially to see Pintail and they did oblige keeping close to shore in big numbers and were clear to see even with the naked eye. They are such an elegant duck with a strikingly erect slender tail. A Pintail flotilla on North Bull Island. Picture by Bill Rea. A fleeting glimpse by a few of a Merlin, as it flew low below the causeway before crossing it and disappearing from view, was the only bird of prey for the day. A few Common Gull were picked up among the many groups of Black-headed Gulls. There was a lone Little Egret, pristine white that flew low over the distant reedbeds. It was not a good day for small birds, we did try ... but only came up with a small flock of Linnet and several Meadow Pipit. On a kinder day the Alders and Buckthorn are good for passerines. Jack Snipe and Short-eared Owl have been seen here regularly throughout the winter but did not show up for us. 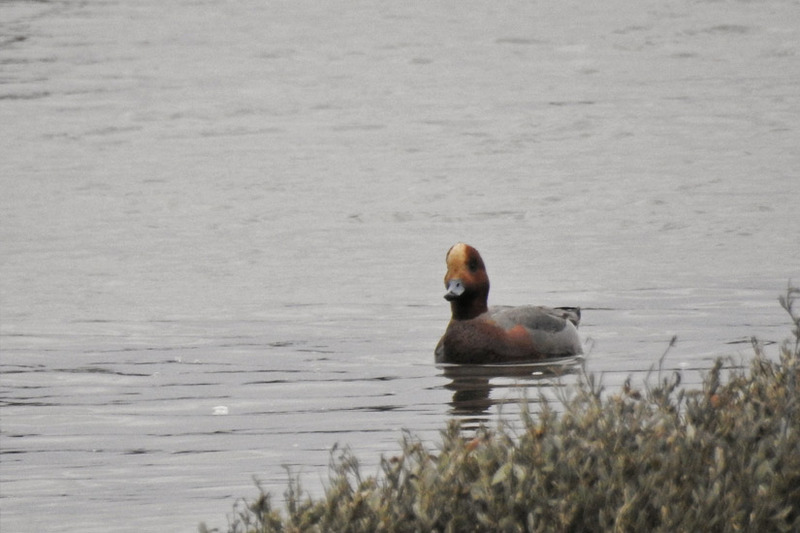 Wigeon at North Bull Island. Picture by Gustavo Zoladz. Some more pictures taken on the day by Bill Rea, Brian Turner and Gustavo Zoladz. 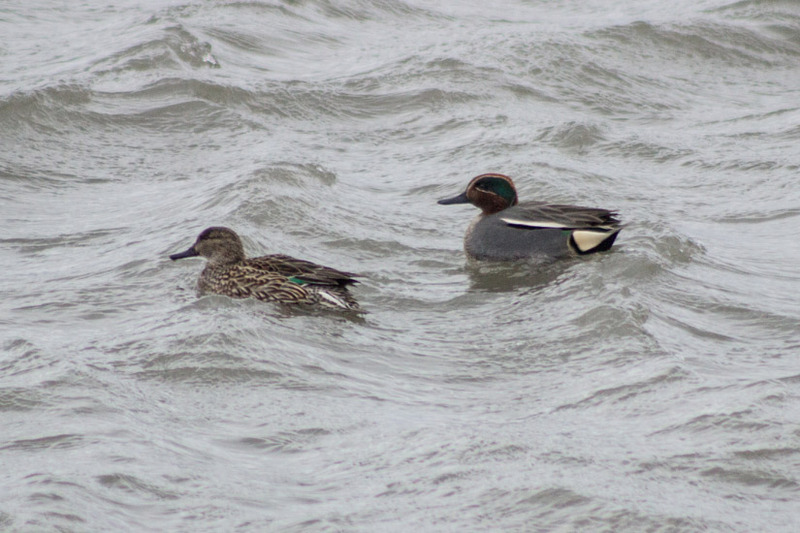 A pair of Teal on North Bull Island. Picture by Bill Rea. 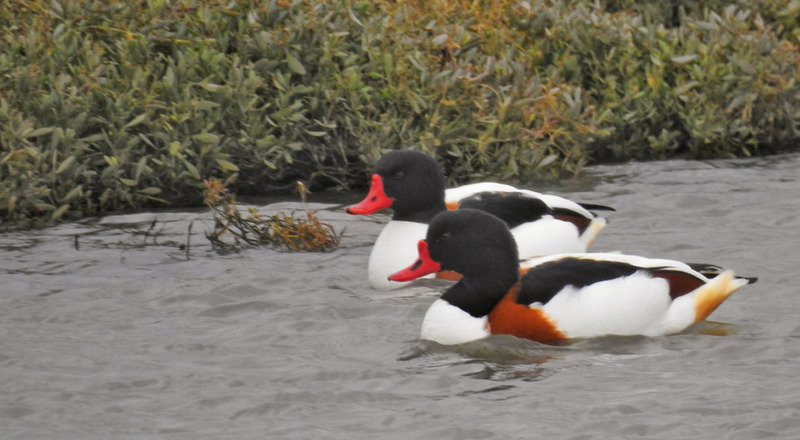 A pair of Shelduck on North Bull Island. Picture by Gustavo Zoladz. 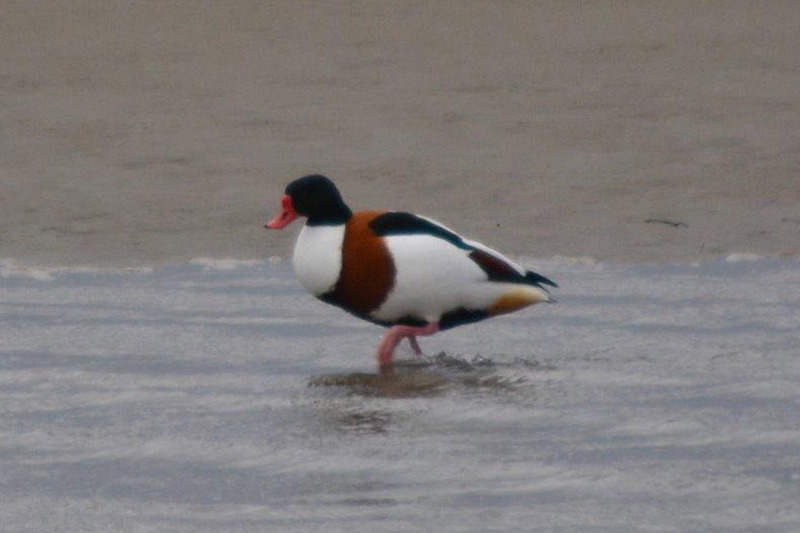 Male Shelduck on North Bull Island. Picture by Brian Turner. 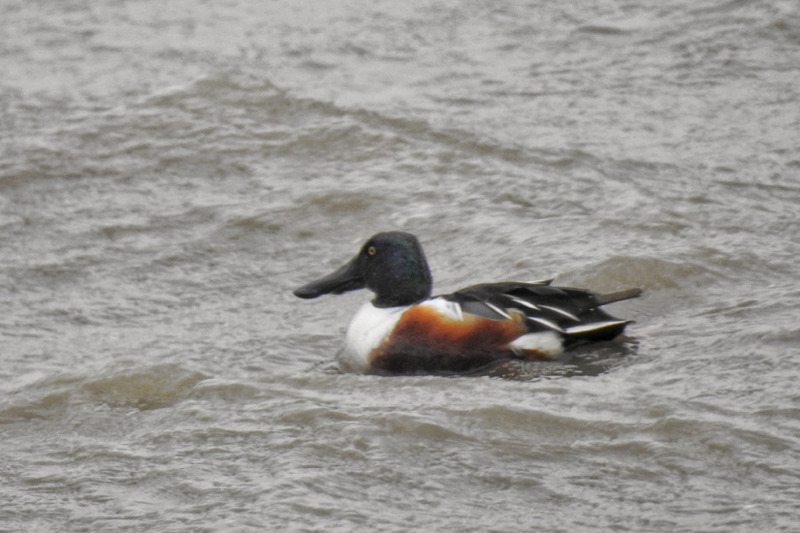 Male Shoveler on North Bull Island. Picture by Gustavo Zoladz. 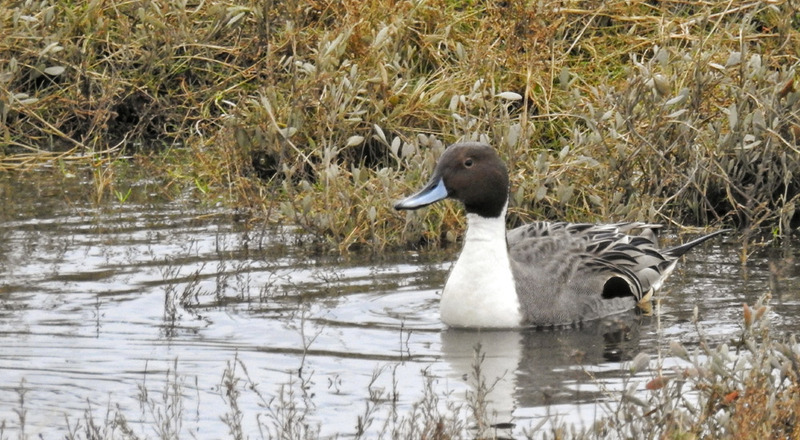 Male Pintail on North Bull Island. Picture by Gustavo Zoladz. 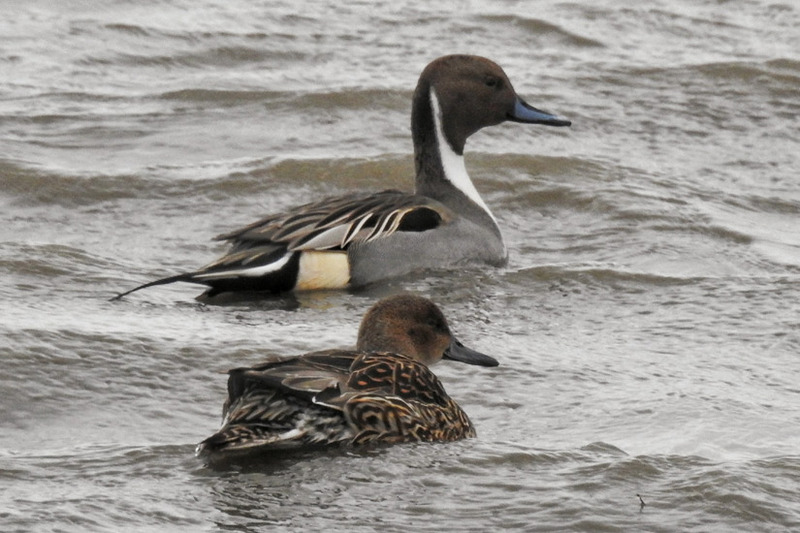 A pair of Pintail on North Bull Island. Picture by Gustavo Zoladz. 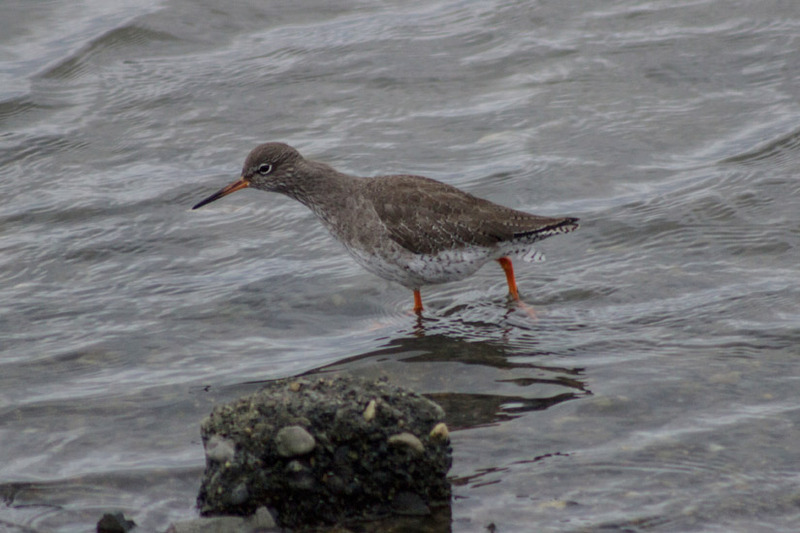 Redshank on North Bull Island. Picture by Bill Rea. Eleanor makes an important identification point. Picture by Brian Turner. A February day to be wrapped up against the cold. Picture by Gustavo Zoladz. More discussions necessary. Picture by Bill Rea. Watching over the saltmarsh. Picture by Bill Rea. I'm sure we will be back to this always interesting location, but I do hope the weather will be kinder then. 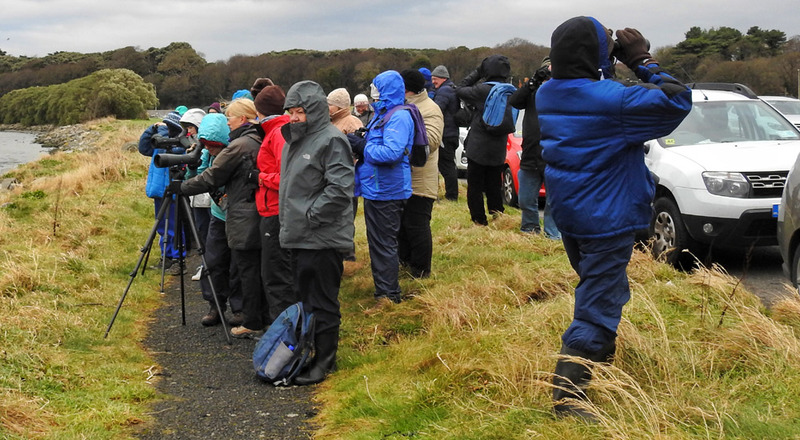 A big thank you to all who braved the gale.